I am a chemist with an interest in environmental and ecological systems. I am good at obtaining information on the molecular basis of plants, soil, water or other substances. Ecologically I am intrigued by the chemistry and ecology of bluebells and bracken, particularly why these two plants often form associations where few other species grow. I have worked on the smell of pines and the chemistry of plant phenolics. I have an interest in the sustainable use of resources and am working on phosphorus speciation. 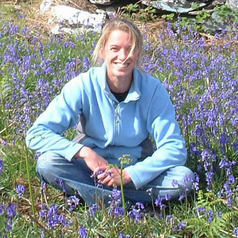 I have an interest in the sustainable use of plants and am working on a model for bluebell conservation. Often my work is applied with an industrial partner, for example the chemistry of giant bubbles. Being a good analyst, samples such as suspect ambergris finds find their way to me and I have received over 50, none so far was ambergris.